Greenmarket customer and food writer Melissa Clark discovered Ray’s turnips and created this beautiful raw salad with arugula and prosciutto. Read the full article in her New York Times column, A Good Appetite. 1. In a small bowl, whisk the vinegar and salt until the salt dissolves. Whisk in the honey, oil and pepper. 2. Using a mandoline or sharp knife, slice the turnips into paper-thin rounds. 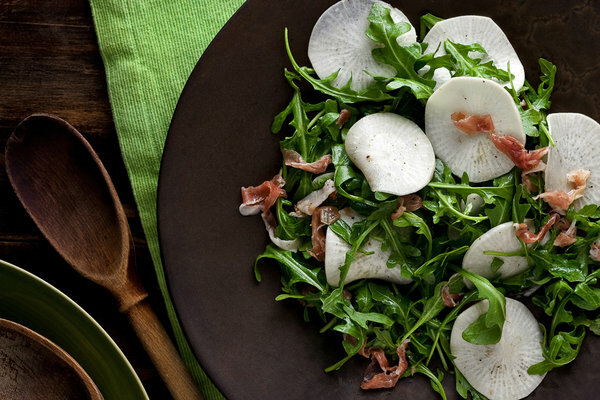 In a large bowl, combine turnips, arugula and prosciutto. Toss with the dressing. Taste and adjust seasonings if necessary. Ray now accepts credit cards for all purchases over $50. Email to fill out application, or get one at the Greenmarket.